And now for something completely different: Not The Larch. Just needed a different color today. Happy Thanksgiving everyone! Lovely! Happy Thanksgiving to you and Bella! Happy Thanksgiving to you all too!!! Lovely orchid. Beautiful photo of a beautiful orchid. Hope you're having a wonderful Thanksgiving. I'm thankful the sun is shining for a change and I'm going to give Frankie and Beryl a decent walk now. Roll on Summer, Spring has been pitiful! That is a beautiful orchid! Hope y'all had the best Thanksgiving ever. A lovely flower! I hope you had a lovely Thanksgiving. Whew, we're still recuperating from Thanksgiving Day here. Hope yours was happy as well! Hi Sugar, Woofs and wags to you! 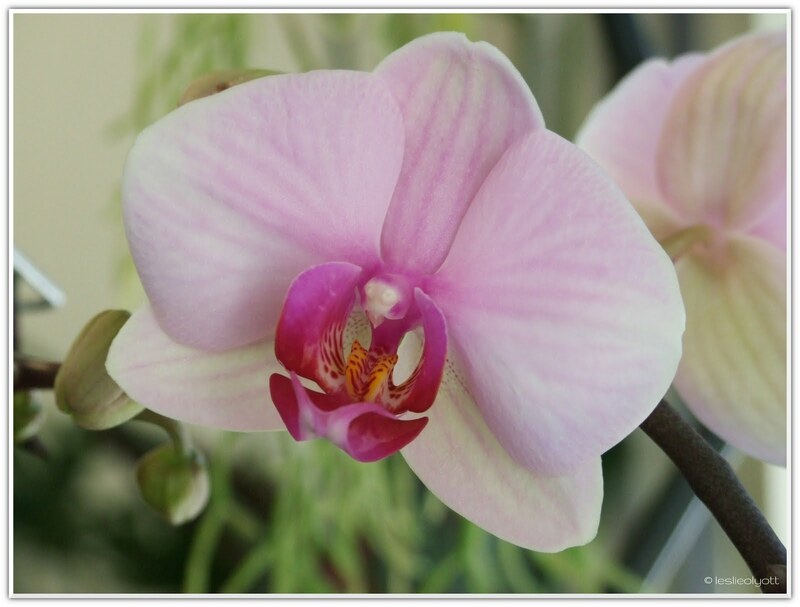 You should ask your mom to get a photo of that orchid flower when it makes its appearance! They are soooo lovely. Happy belated Thanksgiving, to you and yours, too, Roscoe! Thanks for visiting! Lucky Frankie and Beryl, out in the sunshine again! Bella is settling in for the long, dark winter ahead. Makes for good cuddling, I guess, but I prefer spring and summer myself. Hope yours was lovely, too!